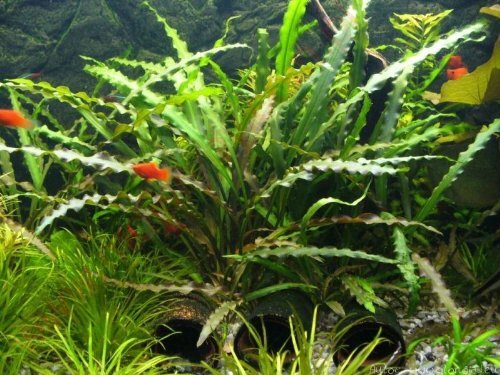 Cryptocoryne is one the most spread and popular tank plants. It is famous for a great variety of its species, forms, colors and sizes. Most of cryptocoryne species renowned among aquarists are rather enduring and undemanding and can be recommended for beginners. Cryptocorynes have lots of various shapes, colors and sizes. Their size may vary from several centimeters to half of the meter; coloring – from yellow to brown; leaves can be both straight and smooth, waved or spiral shaped. Since crypts are paludal plants they prefer light silty nutrient rich substrate, but at that quite often they can grow having only small gravels or sand as a substrate. However, there is a big mess in classification of cryptocoryne species. There is a problem with identification of cryptocoryne species and how they differ from each other. In English the plant is called water trumpet, since its inflorescence appearance resembles musical wind-instruments. Latin name of the kind originated from Latin ‘crypto’ («hidden») and Greek ‘koryne’ («a club»). Such a name was given to representatives of the kind due to their flower structure; because the plant reproductive organs are in its spadix. The cavity which contains the spadix is called a spathe. The latter has an organ that produces blossom dust as well as special cells responsible for the coloring that attracts insects into the cavity for pollination. Cryptocoryne fruit is a segmented seed case. Cryptocorynes are widespread in South-East Asia; the species distribution area includes quite large region: from West India to East Papua New Guinea and form South China and North Vietnam to South Indonesia. These plants dwell on large islands having inland freshwater bodies: Kalimantan (Borneo), Sri Lanka (Ceylon), Sumatra, Philippine Islands and some others. There are no high and long lasting floods there: islands in general don’t have any large rivers; as for Irrawaddy or Mekong, they have rather steep inclined streambed and the flood doesn’t stay long. In case of getting small amount of light, cryptocorynes grow slower. For nigh on ten years knowledge about natural biotopes of cryptocoryne species has essentially increased. During scientific studies it was determined that cryptocorynes, which probably have common origin, have acclimatized to various econiches in the course of evolution. These plants are quite diversified ones and you can encounter them both in streambeds and down by the riversides as well as in small and medium sized rivers which are usually not more than 20 meters wide, having both fast and slow water flow. Almost all cryptocoryne species are amphibious plants capable of growing both on the ground and submerged under water. Habitats of many cryptocoryne kinds are very limited and often they also form endemic distribution zone. In the wild cryptocorynes got acclimatized not only to live in rivers and streams with fast or slow flow, but also on their shores and in various abandoned loops that dry up from time to time, small lakes and puddles left after rivers overflow. Studies that were performed during the last ten years of 20th century have shown that many cryptocoryne kinds have wide natural habitats. Cryptocoryne populations that belong to one and the same kind were found in different areas that are quite far from each other. 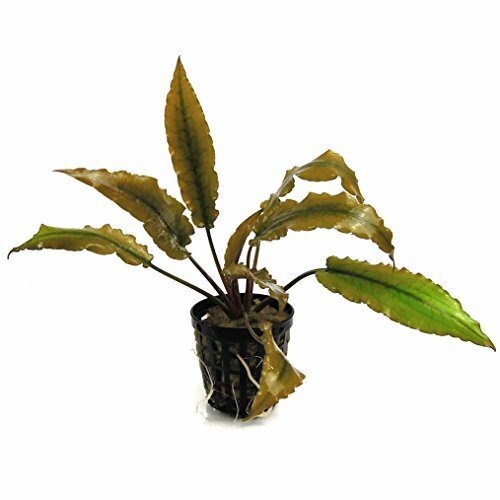 Cryptocoryne species include both very simple ones which can be easily grown even by beginners and quite complicated species to cultivate, which are challenging even for professionals to grow. The most renowned cryptocoryne species aren’t demanding in terms of tank conditions, that’s why these plants are a perfect choice for tanks without CO2 supply and low illumination level. 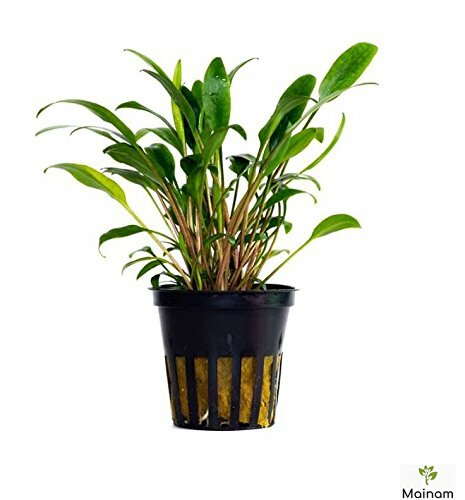 The plant prefers getting nutrients from the substrate, so it’ll successfully grow in old silty substrate or in substrates with special nutrient rich bases without any fertilization with liquid fertilizers. For successful cultivation of cryptocorynes any fan of tank plants should follow these quite simple rules. The first rule is: to simulate the water flow tank water has to be renewed quite often, have hardness level about 8-10 dGH and pH level in the range from 6,8 to7,8. Unlike other tank plants cryptocorynes react adversely to phosphates, carbonates, nitrates presence in tank water. To minimize content of these matters in the water, you should have sufficient number of fast-growing plants in a tank, since they are active consumers of nitrates; regular water renew is a must as well. The main thing for most cryptocorynes is that parameters of their environment should be as stable as possible. Insufficient temperature decrease (1-3°С) won’t do any harm to cryptocorynes. The second rule is: for successful cultivation of cryptocorynes you should provide them with proper substrate. In the wild these plants grow on various soils: from sludge deposits to pebbles of various sizes. Quite often bottom of these rivers is covered with thick layer of leaf debris of different decomposition degree. It is recommended to add some not fatty clay and compound fertilizers (as tablets containing microelements and ferrum chelate which is digestible for plants) into the bottom substrate of a tank where cryptocorynes grow. Most of cryptocoryne kinds have strong, long and very branchy root system. That’s why recommended thickness of the bottom substrate layer has to be not less than 6-8 cm. Provided with such substrate thickness you have to take additional measures to prevent appearance of anaerobic zones in it. The third rule is: environmental temperature is an important parameter for cryptocorynes. Its optimal values are in the range from 23 to 26°С. At that it is crucial to maintain stable temperature conditions with minimal differences between night and day temperature values. This task is easily solved by means of a heater with thermostatic switch. At water temperature values lower than 23°С most of cryptocoryne kinds stop growing, while longer impact of even lower temperatures as a rule causes plants death. The fourth rule is: height of water level is important for successful cultivation of cryptocorynes in a tank. 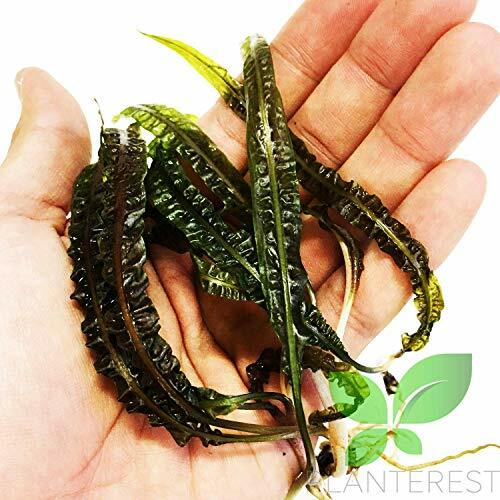 The best value is considered to be 20-30 cm (from the substrate to the water surface) for small and medium sized cryptocoryne kinds. Provided with such height of water cryptocorynes demonstrate brighter coloring, than that in high tanks fully filled with water. A tank about 100-120 cm long and 35-40 cm high will be the best for cryptocorynes cultivation. This is due to the fact that most of crypts have more ornamental look when planted as a large group, which is hard to do in a short and narrow tank. The fifth rule is: illumination – this is an important parameter for effective cultivation of crypts. Despite that it is widely thought, that cryptocorynes are undemanding in terms of illumination, in fact for most of the kinds it is rather critical parameter as well as daylight duration and spectral structure of the light. The best light spectrum can be obtained by combining white and warm white fluorescent lamps or using special phyto lamps. The sixth condition of cryptocoryne successful cultivation is to put them into a tank timely. It is recommended to plant crypts into a tank with settled biological balance. Unlike other rosette plants cryptocorynes easily stand root collar burial: even if you plant it too deep, it will grow without any help. Don’t tear or cut off the roots unless it is really necessary, since the new ones will grow only several weeks later. When planting cryptocorynes into the substrate you can put very long roots in a spiral. You shouldn’t siphonage the substrate in a tank with crypts; this should be done only if the plants start growing slower, since most of the plant kinds prefer silty substrate. Cryptocoryne wendtii is the most variable cryptocoryne kind. Nowadays there are four main forms of this plant which differ only in their coloring and leaves shape. We should mention that cryptocoryne appearance may change significantly depending on the tank conditions. The most widespread is Cryptocoryne wendtii green with oblongish dark green leaves and Cryptocoryne wendtii red with more elongated brown leaves. This kind is very popular among aquarists due to its high ornamental features and adaptability to various environmental conditions. Provided with optimal tank conditions the bush grows about 25 – 30 cm high. The plant forms not very thick bushes. You can keep it in a small tank, but in this case cryptocoryne grows small as well. It is better to put it in the middle distance of your planted tank. It grows under water uniformly all the year round. Cryptocoryne isn’t demanding in terms of temperature, however, tropical tank suits it best. Optimal water temperature is 24 – 28 °С. Water with medium hardness 9-16° is more suitable for this cryptocoryne. In soft water with sufficient pH variations Cryptocoryne wendtii quite often sheds its leaves, though it is less prone to Cryptocoryne Rot, than other representatives of the kind. At least it is better not to keep this plant in very soft water (hardness value less than 4°). Water violent reaction isn’t significant, it can be both weakly acidic and slightly alkaline. There is also a cryptocoryne kind which has appearance very similar to Cryptocoryne wendtii – this is Cryptocoryne undulata. Cryptocoryne undulata is one of the most proper plants for a freshwater tank. It originates from central Ceylon (Sri Lanka). In the wild this plant dwells in the same waters as Cr. becketii, Cr. wendtii and Cr. Walkeri. It grows in a quite fast flow in streams and small rivers; water hardness varies from very soft to hard, рН is in the range 6,8-7,4. Soils are nonuniform – they vary from sand to clayey soils and dust of rotten wood or large stones. In tanks the plant is very undemanding and it can adapt to rather wide range of environmental conditions. In the wild colonies it can be often encountered together with Cr. becketii and Cr. wendtii. Sometimes it is impossible to see between these three kinds due to the likeness of their emersed forms. In fact, there are a lot of unclear points connected with this group of cryptocorynes. Therefore, it is quite possible that we keep in our tanks hybrids of these cryptocorynes. Genetic analysis may clarify this issue, but for now it is very expensive and it can be done only while performing some fundamental research. The plant perfectly reproduces in tanks; new plants appear in close vicinity to parent one. Very often a small plant starts to grow from an inactive bud on a broken stem of the old plant. You should let this new plant flow on the water surface and once a few small roots appear you can plant the bush in its permanent illuminated place. The plant is perfect for small house ponds and for decoration of front plan in planted tanks. Cryptocoryne parva is the smallest one from all known crypts. Its leaves usually don’t exceed 5 cm size and they have only green coloring. They form a small bush from several lanceolar elongated green leaves gathered in a rosette. The plant reproduces by means of spurs growing from the rosette base. Central uplands of Sri Lanka island is a habitat of this cryptocoryne kind; there it thickly grows down by the riverside. This kind isn’t the most widespread one in aquarium husbandry, which is to a large extent due to its slow growth rate even provided with proper tank conditions and its strict requirements to keeping and care. As we’ve already mentioned the crypts growth rate is very low, even if the plant is provided with tank conditions that are ideal for it. Unlike many other related species Cryptocoryne parva prefers high illumination level, requires additional CO2 supply and nutrient rich substrate. Grown by using lastest technology and facility. Carefully inspected and organized before packing. The plant is especially sensitive to lack of ferrum and kalium in the water, which shows in loss of saturated green coloring and appearance of holes in the leaves. Due to its small size this cryptocoryne is perfect for front plan decoration in a planted tank. However, it is quite problematic to form a green ‘lawn’ or ‘carpet’ with its help, which is due to the plant low growth pace and its new shoots appear slowly as well. This is a very popular plant among aquarists which is noted for its outstanding ornamental properties. Its dark olive leaves with reddish-brown inside are gathered in small rosettes. The plant forms not very thick vegetation about 10-12 cm high. You should place cryptocoryne in front side of your planted tank. This plant grows uniformly all the year round. Cryptocoryne beckettii prefers a warm tank. Optimal temperature to keep the plant is about 24 – 28 °С. However, you can keep it at 20 – 22 °С, but at that it starts growing sufficiently slower. Water hardness should be within 8 – 16°. Violent reaction should be neutral or weakly alkaline. In case of abrupt pH shift and water acidification this cryptocoryne may shed off all its leaves. If alcalinity of hard water rises, it usually does no harm to the plant. Illumination level for this cryptocoryne species can be moderate or rather strong, but it must be scattered. In case of direct light it’s better to place the plant in the shade. Cryptocoryne beckettii demonstrates very high growth rate when put into not very thick shadow of taller plants. For the plant daylight duration should be 11-12 hours. This is a very good looking plant with long, blade shaped corrugated leaves. Provided with favorable conditions the bush grows up to 50 cm high. Like many other cryptocoryne species, balansae can have both green and brown coloring. This cryptocoryne should be cultivated in a high tank and placed in the back or near the side walls of the tank. AQUARIUM PLANT - 1 Bunch of Cryptocoryne Balansae. Due to its ornamental properties and relatively low demands to tank conditions, this cryptocoryne is a widespread one among aquarists. In a tank it grows uniformly all the year round. The plant is best suitable for tropical tanks. Optimal tank water temperature is 24 – 28 °С. In colder water this crypt grows slowly and doesn’t reach its maximum size. If the temperature decreases up to 18 °С, it may cause the plant death. Water hardness may essentially vary, but the best hardness values are in the range of 6 — 16°. 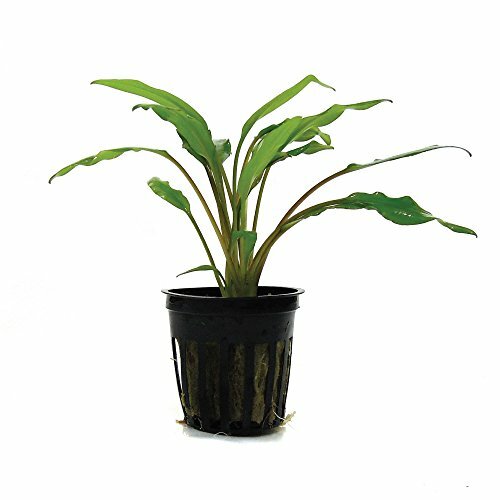 Cryptocoryne balansae is popular among aquarists due to its endurance and ability to grow at various conditions. In summer it can be planted in outside ponds. Despite its unpretentiousness, yet there are some optimal conditions at which the plant grows at its finest. The following parameters are considered ideal for the plant: hard carbonated water, nutrient rich substrate (containing phosphates, nitrates and ferrum), additional CO2 supply. It grows in coastlands of rivers and streams in India, Bangladesh. The plant prefers flooded areas, that’s why it is very suitable for cultivation in tanks. Diversity of its forms doesn’t let us give the precise description of the plant species. Its leaves are gathered in a rosette and form a small bush. Laminas are usually long and ribbonlike; in some cases they have expressed footstalk. Leaves edge is a bit wavy. Their coloring can be both bright green and brown. Emersed and submerged shoots of the plant are essentially different. In air its leaves are twice shorter, harder and elastic. They are about 15 cm long compared to 30 cm of the leaf length under water. On top the leaves are green or brown and palegreen from below as a rule. Cryptocoryne spiralis bloom doesn’t have a tube, it right away transforms into a petal, which is convoluted and has a ragged edge. In a tank this plant forms thick vegetation up to 50 cm high. This is a dwarfy and plain plant about 10-12 cm high, that forms thick vegetation pf bright green color. 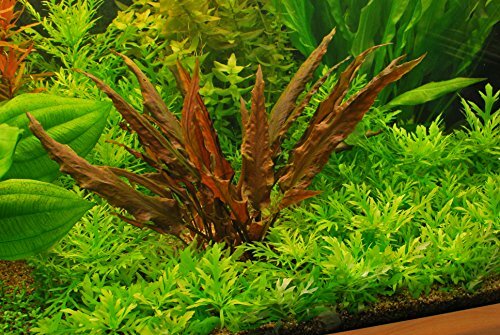 If you place just one plant, it doesn’t look very appealing, but even a small brushing put in front side of the tank makes it look very nice. Cryptocoryne lucens is comparatively undemanding and it will do both for very large and very small tanks. As most of cryptocoryne species, this one prefers dwelling in a warm tank. Optimal water temperature is 24 – 28 °С, but the plant can stand living in colder water. At that its growth rate noticeably decreases. However, we should mention that even provided with the most favorable conditions, this cryptocoryne grows comparatively slowly. Preferable water hardness value should be higher than 8°, although the plant can dwell in softer water. Preferable water violent reaction is neutral and weakly alkaline, while in acidic media the plant growth rate is poorer. Regular water renew is desirable, but it’s not a must. This cryptocoryne species can efficiently dwell in old water rich in humic acids. 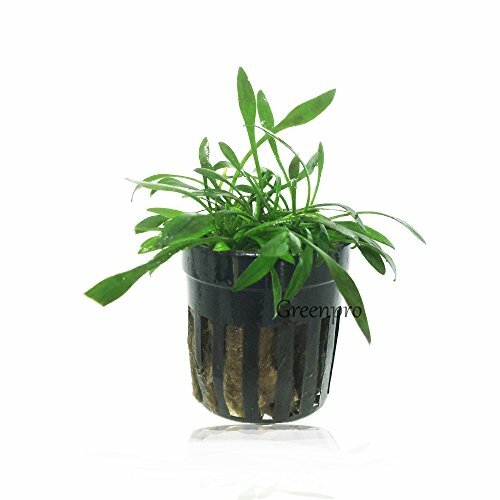 LIVE AQUARIUM PLANTS: Cryptocoryne Lucens 1 Potted, Perfect for any aquarium tank. The substrate should be well silt up. In a new substrate with lack of nutrients the plant grows slowly. When planting this crypt it’s desirable to put a piece of clay mixed with peat under its roots. Large grained river sand or very small pebbles can be used as a substrate for Cryptocoryne lucens. In a large grained substrate the plant roots develop poorly, new plants grow very close to parent ones, young and old cryptocorynes prohibit each other from growing. In a small grained substrate the roots easily propagate and the new plants form a nice uniformly thick brushing. The plant is renowned among aquarists, it is very enduring in terms of unfavorable conditions. Due to its unpretentiousness this crypt can be recommended for cultivation in any kind of tank. Besides, this cryptocoryne species has amazing ornamental characteristics and forms thick brushing 15-20 cm high. It doesn’t have any special requirements to tank water composition. Water temperature can vary within the range from 22 to 30 °С. When the temperature gets lower than 20 °С, the growth rate of the plant becomes essentially slower. Optimal conditions for this plant are the following: water temperature 24 – 28 °С, hardness from 4 to 16° at рН 6,8 – 7,5. However, the plant is quite ok with acidic water with рН less than 6. This species is rather enduring against Cryptocoryne Rot and only abrupt upward change of pH value and acidified soft water may lead to the situation when the plant sheds off all its leaves. To stop this you should drain 1/4 – 1/3 of the tank water and pour water with characteristics similar to the initial ones instead of it. Regular water renew isn’t necessary. The plant grows successfully both in old and new water.